I was introduced to Pomegranate after meeting a Persian women dining by herself at a restaurant. Normally, I would never intrude on someone’s quiet time, but the tables were close together and she noticed me snapping photos of my food. 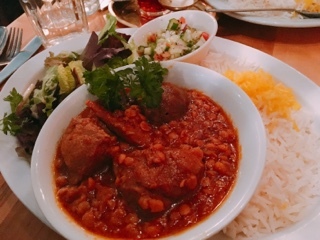 Always in search of good authentic restaurants, I enquired about delicious Persian restaurants within Toronto. Pomegranate, she noted, was a small place, but the food is great and one of her favourite restaurants to visit. 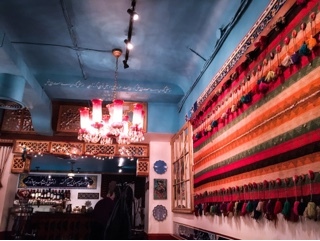 The colourful tapestry adorning the wall instantly put me in a cheerful mood. Despite visiting as soon as the restaurant opened, light aromas of spices were already wafting throughout the dining area, a promise of the flavours to come. The women didn’t lie, it’s a small restaurant with perhaps a dozen tables, so consider making a reservation - even with our weeknight visit, we secured one of the last unreserved tables. 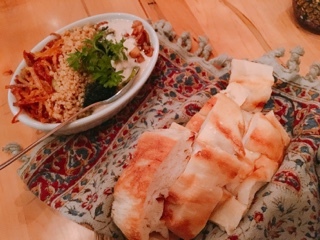 While waiting for our mains, we shared an order of the kashke-e bademjaan ($7.95), which wasn’t big, but rich enough to satisfy our table of four with a couple tablespoons each. A bed of soft charred eggplant is topped with Persian whey, garlic, walnuts and caramelized onions. The starter comes with a basket of hot lightly toasted soft pita bread that’s perfect for scooping up a bit of everything to get all the flavours and crunch. The whey had a light creamy consistency and when mixed with the garlic almost had a tahini feel to it. 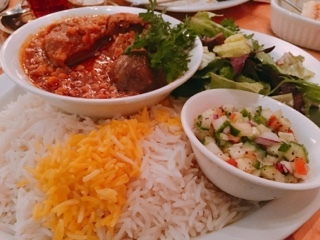 I’m always partial of lamb dishes when visiting a Persian, Indian or Greek restaurant. Hence, immediately the queymeh ($15.50) called to me. The hearty stew is great for spooning over the basmati rice where the tomato saffron sauce could mix with the long grains of rice - oh if only I had saved some of the pita bread to dip into the stew as well! The dish had a surprisingly sour finish due to the sun-dried lime added to the braised lamb and yellow split peas. It took a couple of forkfuls to get used to it, but afterwards I rather like the citrusy finish that helped mellow out the otherwise heavier stew. Yet, I wished all the sides accompanying it wasn’t also sour: the shirazi salad was finely diced vegetables tossed with citrus; even the mixed greens had a vinegar and oil dressing. Anything, even a reduced balsamic vinaigrette with the mixed green, would have helped to provide contrast within the platter. 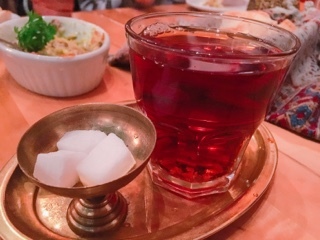 To end, a cup of the Persian chai ($2). The black tea isn’t as strong as its Indian counterpart, lacking the lovely cardamom scent (it just smelt like orange pekoe) and the spices steeped with the tea is evident but muted. If you prefer a weaker tea, the Persian chai may be a good choice. For me, I’d just stick with the tried and true mint version next time. City dwellers are often guarded and like to exist within their own bubbles. Admittedly, I’m no different, not one to strike up conversations with a stranger. Sometimes, it’s nice to break through our comfort zone and get to know someone. Sure, we may never see them again, but what we learn from them could be interesting, useful, and delicious.